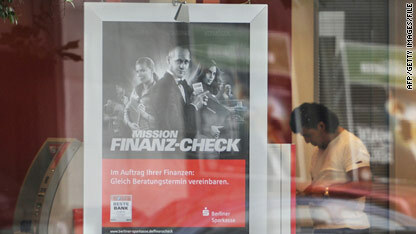 A Sparkasse bank customer uses a kiosk behind a poster on the bank branch's window. A large German bank has come under fire for creating psychological profiles of more than a million of its customers, German media report. Customers of Haspa, a division of Sparkasse, were labeled as "adventurers," "conservationists," "hedonists" and other categories based on interactions with bank personnel, German public broadcaster NDR reported. Bank financial advisers were trained in how to persuade each personality type to invest in financial products, NDR reported. For example, the "adventurer" is "motivated by risk, conquest and struggle," so "arguments should be strongly emotional, to trigger their sense of impulsive decision making," NDR reported. "Hamburger Sparkasse are doing the opposite of helping their customers make responsible choices, by getting into their heads to manipulate them into make choices that are not really in their interest," consumer advocate Edda Castello told NDR. The bank said it would halt the practice, German news service The Local reported. Gee who would have guessed. The poster looks like an updated Nazi propaganda piece. Actually, it could be the cover of any action movie. Unless those are nazi propaganda pieces as well. As if WhiteKong knows anything about the world that isn't stereotypes from 60 years ago. [irony]Yes, because everything Germans are doing is racial motivated. [/irony] This advertisment is refering to James Bond and if James Bond has anything to do with Nazis than I've missed the point of the movies. Basically it's supposed to be some sort of James Bond parody (that's why it says Mission Finanz-Check) lol. In America it is called "marketing". Exactly – it's market segmentation based on consumer buying behavior. Nothing sinister here, just an attempt to offer people products and services they might value. One caveat – you're not supposed to leak the segment monikers, as these are usually along the lines of pithy one-liners. Who cares? Websites do that with cookies all the time. Even CNN does that. Ultimately it's up to the customer to decide what they want to invest in. No one is forcing them. So true,that's why CNN is not even allowing me to sign into their site or "like" comments anymore. I've probably been profiled "high risk" due to my anti-Israel-yet pro-Jew comments of the past.I'll be very surprised if they publish this reply. Yeah considering WhiteKong isn't anywhere near 60 years old that makes sense. That's ok I will trade stereotypes with you all day. I would agree that it looks more like a James Bond parody which offends the 50% English side of me. Oh mein Gott.......das ist verrueckt!!!!! JAN BREWER WILL OPEN SEVERAL BRANCHES IN NAZI-ZONA TOMORROW !!! Do you mean to tell me that the American way of doing business isn't kosher overseas? Who'd uh thunk it?! I think this is called marketing, although intrusive and agressive, it's just business. Deutschen ... immer Denken außerhalb der Box! Um, folks, this is called 'sales'. Whether you walk into Buckle or Calvin Klein or Macy's or a car dealership, you are talking to people who have been trained in exactly this way. Read the book "Why We Buy" and start taking more control in your life. Did you ever wonder why Geico, Priceline, Toyota and zillions of other commercials jam away at you every day, even though you think it's isn't affecting you?? I got news for you...it IS affecting you, and only the naive think otherwise. Caveat emptor.